Shoppers walk among the Eaton Centre with its curved glass paneled ceiling. The Eaton Centre is a well-known tourist attraction in Toronto. Three levels of stores can be seen from this view with more levels above. A large advertising banner sits to the left. 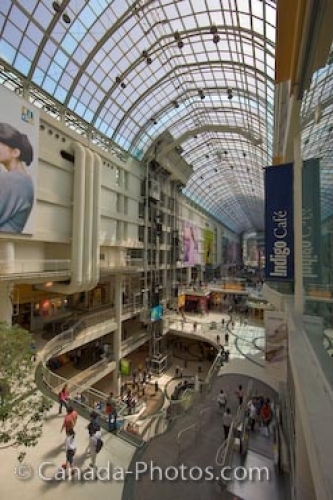 Interior of the Eaton Centre in downtown Toronto, Ontario, Canada. Shoppers walk among the stores of the large Eaton Centre in downtown Toronto.